Here in Uganda there are many public holidays. The government closes for national, Christian and Islamic holidays. We are still learning about some of these. On Wednesday afternoon we discovered that GSF employees were off on Thursday. It was a Muslim holiday and since schools are closed, the staff also was off to be at home with their families. Since the staff vans were not going to run, the young woman who helps us teach and helps with our kids would not have transport. 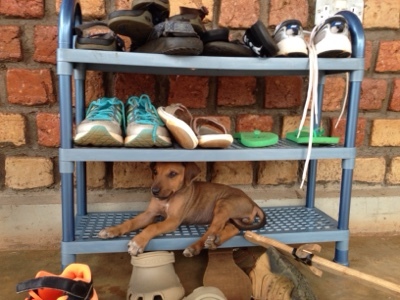 Also our student who lives in Jinja would need transportation. Instead of trying to arrange all of that last minute, we decided to take the day off. It was great to have a day that was a bit more restful. David had a lot of grading to do and is also preparing to preach on Sunday, so a day without teaching was very helpful for him. Our kids all found ways to occupy themselves. 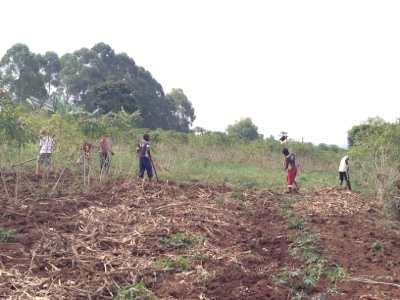 Elijah helped the GSF boys working in the garden. 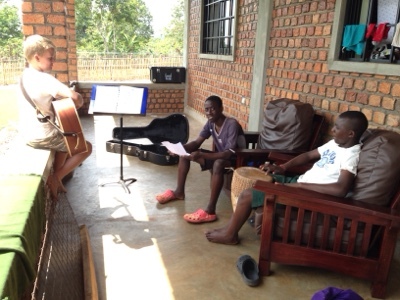 Later in the day, there was an impromptu practice for the Amazing Grace Band on our front porch. I love listening to these kids make music together. One day I'll post a video of them. They sound awesome! Esther and Anna decided to do some "cooking." 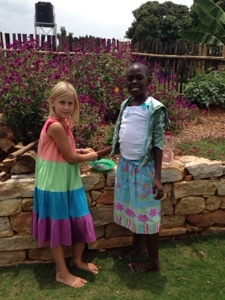 They enjoy making various concoctions from what they find in the yard. Ezra, Zeke and Bobby had fun with the various creatures they found. 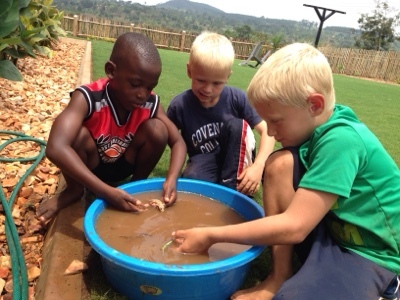 On Wednesday we began talking about the letter "G" and on Thursday they caught grasshoppers and geckos. I found these boys testing to see which of these animals were able to swim. I'm not sure why mud was necessary for this experiment other than the fact that they love to play in the mud. I was able to visit some friends in the village and check on baby Esther, who has not been able to get enough milk from her mom. When a mom doesn't have much food or easy access to clean water, it can be difficult for her body to produce milk. Please pray for baby Esther and her mom. I also took some time on Thursday to just rest. Of course, with so much else going on, it can be challenging to find somewhere quiet, but I took my cue from Penny and looked for any quiet place to rest. As I was taking some time to rest, I started thinking that maybe I should go do something more. I could visit my neighbors, I could see if someone was available to study the Bible, I could go to visit some of the GSF kids. But as I sat there and prayed about these things, I knew that God was reminding me to "Be still and know He is God." (Psalm 46:10) Many times I think that I need to be the one doing things. I want to be willing when He chooses to use me, but I also want to always remember that He is the One who can change people's hearts and lives. Not me. On Friday, God showed me a beautiful example of just that. A young man who we have been praying for, asked for a Bible to read with his wife. He said that they are wanting to become Christians and want to start reading the Bible together! I was thrilled and so thankful for the way that God clearly worked in the situation without me. He has been working in the hearts of this young couple! I am so thankful to be able to see a little glimpse of what He is doing! Even though there are always a gazillion things that I feel like I could and sometimes should be doing, I am thankful that the work is in His hands!